We're actively seeking Mayors/Barons, Citizens need not apply! Our County is made up a group of five (5) friends who make up our core, we are 5 out of the 9 who originally made up a Barony that soon turned into a County, then a Mega County. Most of us have known each other for years or months and have built a relationship strong enough to know one another's Interests, Strengths, Weaknesses, and Playstyles. Sterling and I have lead a handful of Guilds throughout our MMO career, whether as GM or Co-GM, we've been in some of the best guilds on a server and some of the worst, and have dealt with many clashing personalities some of which had to be dealt with as a Kick or a Ban. All of us have been through the many archetypes of Guilds and people like anyone else who puts significant time and effort into games - we've been there and done that - we seek to make something better, long lasting, and bigger than any other community we've built. What does it take to be a member of our community? To join the community and not just a gear in the machine that'll keep the lights on you'll need to be Mature, 18+ (preferred), and have the ability to use Voice chat while online if needed. We do not have strict requirements at the moment, and don't plan to stricken them anytime soon. We accept and welcome all playstyles except those seeking to harm someone within our Kingdom not only in-game but also to their actual person, we do not care for petty grudges you hold against a person outside of a game and will not tolerate such people within our community. We're looking for people fill out our County and our Community who want to experience the game to its fullest potential. Guilds, Organizations, Associations, Businesses, Colleges, Covens, Cults, etc. Our group is PvP and PvE orientated, with a heavy hand in Military tactics, Siege Weaponry Research, and discovery of Combat Arts along with the Counties many Focuses and Exports. If you're looking for a place with an Open-Mind and Open-Arms please get in touch with us. 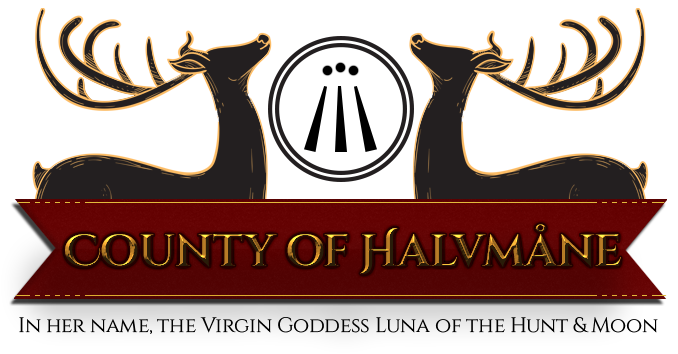 The County of Halvmåne has the goals and aspirations like any other County; She wishes for her Lands to thrive, her People to Prosper, and her Noble Family to be forever admired. We are a Peaceful people, but we our Temple teaches the many skills and values our Goddess possessed; Archery, The Hunt, and the love of Nature and her Bounty. Outside of our love for our Goddess we as a people also value Education; the Capital and even some Baronies will be home to our many schools ranging from the teachings of Combat Arts, Technology Research, and Medicinal/Alchemic Studies. We want our citizens to be knowledgeable about their surroundings, and the arts in which we utilize to help our County grow and prosper with the Blessings of Luna to guide us. Pledged to Her Lady; Lady Luna of The Moon, The Hunt, and The Pure (read: virgin), the People of Halvmåne worship the pliable soils, plentiful harvest, flourishing game, and peaceful borders that She has blessed upon our Lands. Nature is our one true Ally and our most feared Enemy, we value the balance we have come to achieve with the world around us and damn those seeking to enrage our Goddess with destruction of Her lands. Spread the Love and Teachings of our Goddess Luna; caring for the less fortunate, properly tending her lands, and taking only what is required to survive as a County. We do not seek endless and destructive wars like other Realms but we will do most anything to stop any enemies threatening our livelihoods. 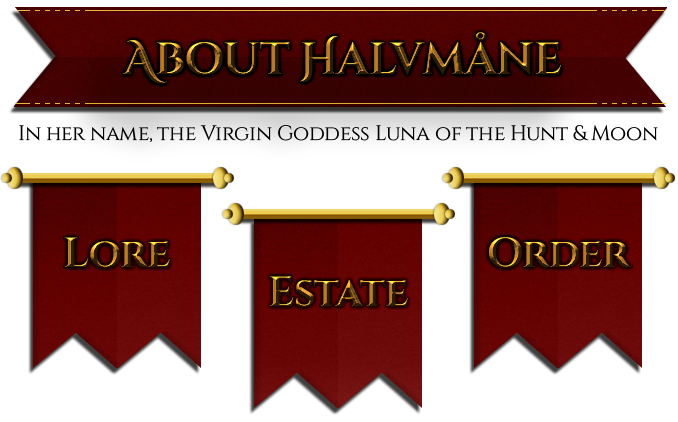 The House of Payne-Whitetail and Halvmåne’s People welcome all within her walls with open arms; all who seek citizenship, business prospects, and refuge from the wild. Please do not mistake our welcoming stance as weakness, we house a multitude of Adventuer's Guilds, and have a strong Military presence on top of our well known Schools, Universities, and Medical Institutes including our Temples of Luna and General Hospitals. Actively looking for Trade Agreements, expanding Organizations, and the time of day from Political leaders. Our Estate is the cornerstone of the County, and only holds such a title through the Citizens who inhabit it, and we thank each and every one of our Citizens, Aristocrats, and Council members for their hard work and dedication towards the progression and growth of this County. The Estate of Payne-Whitetail is within the City of Nattehimmel, the epicenter of the County's most prestigious Universities and home to one of the largest Temples of Luna within the Kingdom. The House of Payne-Whitetail consists of two families, one being Payne with Sterling being as the descendant carrying on the name, and there’s Whitetail, a surname that recently surfaced within the bloodline of House Cromwell. Though married they do not share names, their bloodlines are intertwined but they are not one. The County is an absorption of the singular Counties ran by either family then combined for the better good of both their people. 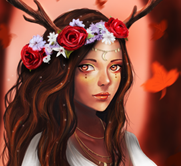 Awenita (Lunaus) Whitetail is however the main figurehead handling almost all County affairs but Sterling Payne has just as much say in the development and maintenance of the (double) County, as well as the laws that oversee the safety of her people. However, his main duty within the County are with the Baronies and their forces. Family Motto: "Fealty to one"
Family Motto: "In her name, the Virgin Goddess Luna of the Hunt & Moon"
Priestess of Luna - Maintain the Temple of Luna... Details Here. Architects - Skilled artist to design custom buildings and structures. Town Crier - Someone who can relay public information about current events. Professors/Scholars - Those with the aptitude to teach others. Bankers/Bookkeepers - Someone who'll run the Counties bank and help keep tabs on incoming and outgoing funds or taxes. Physician(s) - Knowledgeable in the arts of medicine (alchemy, herbalism, etc). Tailor/Clothier(s) - Design exclusive attire/patterns for the Noble Family. Stablehand(s) - In charge of caring for the Noble Families stable. Groundskeeper(s) - Prune and maintain the grounds of the Estate. Gravedigger(s) - Personally sees to the proper burial of the Noble Family. Scribe/Courier(s) - Personally delivers parcel for the Countship. Maid/Servant(s) - In charge of caring for the Noble Family and their home. Chef/Baker(s) - Preps every meal, snack, or treat requested by the Noble Family. Bard/Artist(s) - Personal entertainers for the Noble Family. The Governing body of the County. All Barons & Mayors are automatically on the board, making them able to sit in on meetings between the ruling family, Payne-Whitetail, and the appointed Advisory Council: Domestic, Foreign, Assistant in Military, Assistant in Technology, and Assistant in Emissary. The Advisory Council are nominated and voted in by the citizens then elected by the ruling family, if the citizens have an issue with the Advisor handling affairs involving them they have the right to bring this to the Ladies attention and cast their votes if more than one person is nominated. Much like the votes within the Settlements of Barons & Mayors the amount of land one possess will be the number of votes one can cast in favor or against a nominee. A nominee cannot nominate themselves but they can vote for themselves. Domestic Advisor (0/1) - Will be in charge of all citizen and noble relations, agriculture (alongside Tech Advisor), and business contracts/inspections within the County. Must have great diplomacy skills. Foreign Advisor (0/1) - Will be in charge of all relations, contracts, and other dealings outside the County, Duchy, and/or Kingdom. Must have great diplomacy skills. Assistant Military Advisor (0/1) - Will be the assistant of Count Sterling Payne for all Military related tasks. Assistant Technology Advisor (0/1) - Will be the assistant of Countess Awenita Whitetail for all Science & Technology advancements and research. Assistant Emissary (0/1) - Will be the assistant of Baron Caraway, and the advisors of Foreign and Domestic advisors in diplomacy. Representatives of the Vassals (0/10) - A small body of Elders to speak on behalf of their communities that do not meet the requirements to hold the title of Mayor or Baron. These high ranking citizens won't be required to live within the capital, depending on their role they will always need to be in contact with the Barons and Mayors to ensure any tasks needing to be carried out are properly explained and assigned to those who best fit the qualifications to ensure it is completed without a hitch. At the moment these roles aren't promised permanently in the sense that if the citizens do not agree with how the Advisor(s) carry out their duty they will have the opportunity to designate a minimum of two other citizens who could fulfill the job, the Count & Countess as well as their internal committee will then vote on their favored candidate to take on the role. There is no set timeline (at the moment) as to how long a citizen needs to be in office before being voted out. Magistrate(s) Mayors (or Barons) who have accumulated enough land and acquired a Courthouse to form a City who'll handle lesser offenses within the County. County Sheriff Investigators of the County; they are one of the first to be dispatched on the scene of crimes that are deemed severe enough to warrant escalation to the County Court. Court Guards Captains of the Guard who has been promoted to serve as officers of the Court. Executioner(s) In the rare case of a death penalty the Executioner will carry out the gruesome deed of ending the life of the guilty. A Gravedigger will also be available by proxy if a death results in permadeath without a next of kin to claim it for burial. Court Reporter(s) Someone who'll transcript the entirety of any trial held within the Noble Court (and possibly lesser courts). Orator(s) Lawyers who will work off the information provided to the Court by the Sheriff of the County. Depending on mechanics one will be appointed to the Accused and the other will represent the County. The Temple of Luna within the capital is the main center of worship for our Goddess Luna as well as where the common folk can go to receive healing services with the blessings of Luna. All are welcome to worship, spectate, and heal within the walls of the Temple, even those who pray when it is convenient for them, or complete heathens of false Gods seeking hand outs. No matter your walk of life Goddess Luna will guide you through the Night with her shimmer light, no matter the phase of the Moon her light will shine and guide you. Her arms are always open to Mann and she welcomes you if you choose to see once more through the dark veil that has casted you away from her, you only need to call her name to be saved once more. Being out past dusk during a New Moon is considered bad luck. Approaching a bathing woman shrouded in the light of Luna in the wild will be kidnapped by angry fairies. Laying with a Priestess of Luna during her ordination will turn you to stone at night like a troll in the sun. Priestesses. Female only, or effeminate/androgynous male(s). Pure of Mind, Body, and Soul. Virgins only, just like Goddess Luna. Midwife. As the Goddess Luna was chosen to become a midwife so shall you. Skilled Huntress. Must train in the ranger arts and hone your skills as a hunter. Skilled Healer. Must train in medicinal arts and hone your skills as a healer. Charitable. Assist with the sick, diseased, and dying in the Temples/Hospitals. Personal Guard. If chosen you must protect the Count/Countess as a bodyguard; retinue. All necessities will be provided for those who qualify and are chosen to be a Priestess of Luna. You will have room and board, uniforms, and specially crafted weaponry that only you, as a Priestess, will be in possession of - it will be your badge of office and considered a sacred artifact bestowed upon only those worthy in the eyes of Luna. Once a Priestess has reached an age of maturity they will still remain a Priestess but will no longer be invited to be within the Countesses retinue and will be expected to work primarily in the Temples, Churches, and Hospitals as Healers for those less fortunate. They will also be expected to assist in the training of Seminarians (read: priestesses in training), and the personal care of the home of the Noble Household. If you are not interested in becoming a Holy Embodiment of Luna and dedicating your life the link between Mann and Luna, but still wish to be taught and trained in the ways of our Goddess there is hope yet for you.. Our temple will also offer a Coven for womenn to submit themselves to awaken and restore the deep connection they possess with the Goddess Luna through sacred ritual. However, this path is not for everyone, though the process is not as daunting as the path of a Priestess it is not for the faint at heart either. You will need to face your inner demons and confront the reasoning for Manns banishment from the heavens, only true followers will make it through to the end and experience the true potential of Mann that was stripped from us due or our ignorance. Are you capable? These individuals can come from any background but much like the Priestess they are also required to be proficient bards (singing, dancing, etc). They are a group, minimum of 5 to 10, dancers who perform for the noble court and any seasonal festival. The Nymphs are in charge of the Oasis (Adult Bath House), where they are expected to entertain any guests who enter with song, dance, and refreshments for as long as they stay. Any private requests will need to ne requested ahead of time so that all the proper arrangements are handled before the guest(s) arrival. Anyone with deep pockets and a burning passion for live companionship is welcome to take part. A Kingdom is nothing without her Dukes, and the Dukes nothing without Barons and Counts, and Counts with Mayors, and Mayors without Citizens and other Gentry. All in all a Kingdom needs her people at each level to be deemed worthy of the title Kingdom. Our County holds all her people dear to her heart as if each and everyone of them were her own children, she’ll always cherish her people no matter their choices or affinity. So if you ever fall on harsh times, dark times, bountiful, or light she is always there with open arms to greet and coddle you. For those interested in housing your Barony within our County please join us in Discord. Families and businesses with deep rooted history within our County may be offered discounts or other special privileges that would normally be reserved for high class individuals. The details on these offer(s) will be further disclosed the closer we get to KoE, Expo, and Launch. If you have any ideas or suggestions please feel free to contact myself (Awenita/Lunaus) or Sterling on Discord. We are nothing without our loyal citizens. The focus of a County is Construction and Maintenance of Public Structures/Buildings, Facilities, and Roads. We'll strive to provide Public Schools for any settlement within our borders that wishes to encourage citizens to learn basic Life Skills to foster a self-sufficient community. We'll also try to ensure there is at least one banking establishment is within each settlement, as well as any other basic Structure or Facility that may be needed once we have more information on possible buildings. This is where we will house all registered associates, organizations, and guilds within the County. 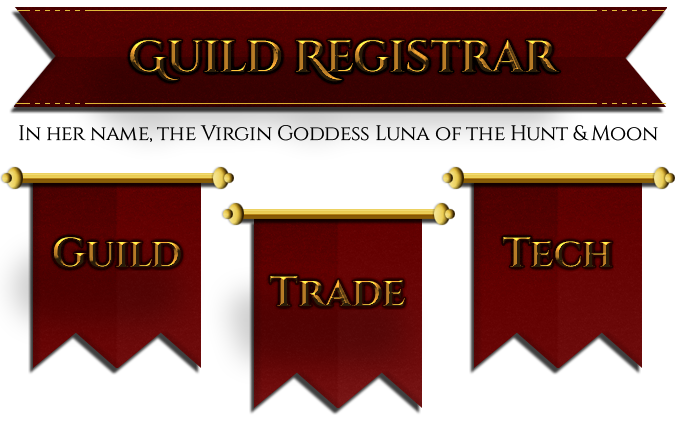 If you are interested in housing your guild within the County please visit our Discord to iron out details and get to know one another. I will not be limiting how many groups can settle within my borders but I will cherry pick specific groups that I prefer over others, especially when it comes down to crafting and merchant guilds whom will be fighting over my finite resources and the business of my citizens. This also includes any guild who specifically works for the Noble Family for their personal leisures. 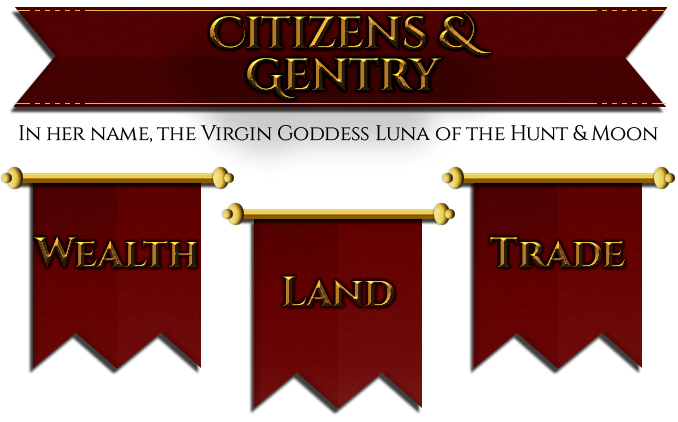 There will also be an "Adventurer's Guild" of sorts within the County's Capitol (Nattehimmel) that travelers and adventurers can visit to view the County's Bounty Board and possibly join one of the pre-existing Guilds/Associations/Organizations. Temple of Luna A place of Worship, Healing, and a Medical University. Sacred Sanatorium The largest hospital in Halvmåne; the different medical branches and research centers are named after the beloved and fallen of our ancestors. Whitetail Academic College A Community College of sorts, this is where all free-use crafting workstations as well as other training or crafting equipment and personnel. All classes, and general admission is paid for by the Count and Countess. Waning Moon, School of Druidry A school teaching the ways of a Druid; ranged and melee combat, hunting, field dressing, and other such skills. University of Halvmåne; Technological Advancement & Research University for the scholarly seeking to research the growth and progress of tech advancements (weaponry, food storage and longevity, structure improvements, relics and artifacts, and much more) for the County and share their knowledge with other scholars. The Honorable Crosson Military Academy Honorary military academy housed within the Barony of Caraway. The Nymphs Oasis An Adult bathing house founded by the Countess herself. Whitetail Vineyard A high-class Vineyard owned, and ran by the Countess herself. If you are interested in any of the listed positions or would like to learn more about our town please visit our Website and/or Discord for more information. Ages 17 or older - We are mature in nature, and are all consenting adults. However exceptions can be made depending on the person. Mic & Headset - Communication is key, being able to speak through voice is very helpful and potentially crucial to all of our survival. VoIP program(s) is (are) required. Community Activity - A minimum of 4hrs per week of your time (depending on circumstances) towards your in-game community in a helpful manner through in-game or other means. Website/Forum Use - There’s no post requirement but it is appreciated when members use our own dedicated forums for communication outside of Discord. Self-Sufficient - Able to research a problem before asking questions, this includes looking at the Forums, Wiki, Reddit, and even our own Website for common information. Ambitious - Members have to have a directive beside the goals of the county as a whole; everyone needs to progress and grow individually as much as the county itself. We’re only as strong as our weakest link. Community Orientated - Able to share their knowledge in a friendly and helpful manner with other members and the CoE community as a whole. Concept of Order & Structure - We need our members to be able to follow the rules set forth to keep everyone alive and happy. All ranking members must be given the respect associated with their title and as a person. Please be aware these are only required of those who will be dealing with the core group (Noble Family) directly on a fairly frequent basis. Normal citizens who settle within our borders are not required to meet any of these requirements unless they wish to take on a role stating they must. Fowell on FurAffinity - Custom/Commission rendition of "Awenita Whitetail"
I must say I love your thread's organization and graphics. Very nice. Looking for Barons or Mayors interested in residing within my borders. I'm tweaking and adding additional information on some roles within my County, as always anyone is welcome to join and ask questions or just hang out, chat, and game with us! I'd also like to take this time to offer my services as a Web Developer, and Graphic Designer if anyone is seeking to have similar designs done as presented in this thread, and on our Website. I am also knowledgeable with logo design and can make some basic traditional crest designs! PM/DM me for more information. I am officially on my way to becoming a Countess, the layaway process is now in motion and I plan to have my County before Spring of 2017. I would like to formally announce that we are now pledged under the Rule of King Sev Kimura of Ashland, and serving Duke Ambrosius I: of Sanctaphandri. Thank you Arthos, I wish you luck as well! With that in mind our Kingdom Recruitment Thread has been released today for those wondering what we as a Kingdom stand for. Join us on Discord! Whether you join or not, East and West welcome.